Experience the amazing northern lights in Norway. Travel north and join cruises with Hurtigruten, exotic winter activities and northern lights breaks. Authentic Scandinavia AS is a dedicated Norwegian tour operator offering independent package tours and escorted coach tours throughout Norway. Experience the spectacular Norwegian nature; from rugged mountains to deep fjords; from pitch black winters to light summers, from dramatic waterfalls to still lakes. During the winter months, the Northern Lights Tours & Cruises are by far the most popular. The many tour combinations, which can all be booked online, are described in detail on their website. In Northern Norway, above the Arctic Circle, you will enter the land of the northern lights. From late autumn to early spring this is where you will have the possibility to experience nature's own firework: The northern lights, or aurora borealis as they are also called. The northern lights are particles that are hurled into space after storms on the sun's surface. They are attracted by the magnetic North Pole (and the South Pole) and enter the atmosphere in a ring-like zone around the poles. Most of the northern lights outbursts visible are green, but large outbursts can also include other colours. In order to see the northern lights, the sky must be dark and clear. It is, therefore, easier to see the northern lights away from the lights of urban areas (the greatest frequency is between 6 pm and 2 am). Patience and dedication will pay off. The northern lights might be visible for a couple of minutes or most of the evening. Please note however that northern lights observations are not guaranteed. The northern lights are particles that are hurled into space after storms on the sun's surface. They are attracted by the magnetic North Pole (and the South Pole) and enter the atmosphere in a ring-like zone around the poles. Most of the northern lights outbursts visible are green, but large outbursts can also include other colors. The northern lights, exotic winter activities, ice hotels, and Hurtigruten cruises make Northern Norway the perfect destination for a winter adventure holiday. Located right in the middle of the Earth&apos;s northern lights belt, the area surrounding Tromsø offers excellent chances of spotting the northern lights. 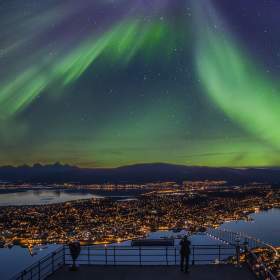 Tromsø is also the largest city above the Arctic Circle, making it the perfect destination if you want to combine urban life with exotic winter activities such as dog sledding, snowmobile- and reindeer safari under the northern lights. Return transfer from the city centre is included in all excursions and safaris. Located right in the middle of the Earth&apos;s northern lights belt, the area surrounding Tromsø offers excellent chances of spotting the northern lights. Tromsø is also the largest city above the Arctic Circle, making it the perfect destination if you want to combine urban life with exotic winter activities such as dog sledding, snowmobile- and reindeer safari under the northern lights. Return transfer from the city center is included in all excursions and safaris. Kirkenes is a small town located in the very northeast of Norway, next to the Russian border. Just outside the town centre, you will find Gabba Reindeer Park and Kirkenes Snow Hotel. Here you can meet the reindeer, enjoy a delicious meal and overnight in the snow hotel. Other activities available in winter include an excursion to the Russian border, king crab safaris, dog sledding excursions, and snowmobile safaris. The last two are also available as evening excursions under the northern lights. Kirkenes is a small town located in the very northeast of Norway, next to the Russian border. Just outside the town center, you will find Gabba Reindeer Park and Kirkenes Snow Hotel. Here you can meet the reindeer, enjoy a delicious meal and overnight in the snow hotel. Other activities available in winter include an excursion to the Russian border, king crab safaris, dog sledding excursions, and snowmobile safaris. The last two are also available as evening excursions under the northern lights. Hurtigruten is often referred to as the world&apos;s most beautiful sea voyage. A cruise with Hurtigruten is an attraction in itself; in the winter season you will cruise by landscape covered in pure white snow; the air is fresh and crisp; the arctic light of blue, icy white, fiery yellow is quite magical. Enjoy delicious food made from local ingredients, keep a lookout for the northern lights as you relax in a hot outdoor jacuzzi and join optional shore excursions. The Hurtigruten cruise connects several exciting winter locations along the Norwegian coast, such as Tromsø, Kongsfjord and Kirkenes. These are all located above the Arctic Circle and offer excellent chances of spotting the northern lights. A popular option is to combine a northern lights trip with a tour to the spectacular Norwegian fjords. This is possible by going on a fjord tour followed by Hurtigruten&apos;s northbound cruise from Bergen, the gateway to the fjords, to Kirkenes, located by the Russian border in the north of Norway. As an alternative, you can book a flight to Northern Norway after visiting the fjords in Southern Norway. Travel to Norway with Authentic Scandinavia AS, and choose from a wide selection of independent and escorted tours and holidays. Due to the temperate waters of the Gulf Stream, Norway has a much milder climate than other parts of the world at the same latitude, such as Alaska, Greenland, and Siberia. Still, Norway has a lot of weather.